I recently purchased a Savage bolt action and put a .35 Whelen barrel on it. So I've found your website very useful and helpful. Next I had Mountain Molds make a 280 grain mold in .350" diameter for paper-patching. I've had good success with these bullets and am very impressed with the Whelen's capabilities using paper patched bullets. Unfortunately hunting season is only 9 days here so I haven't been able to test these babies on game. But I thought you might be interested in some of my results, and perhaps would be willing to load up a box yourself to experiment with. 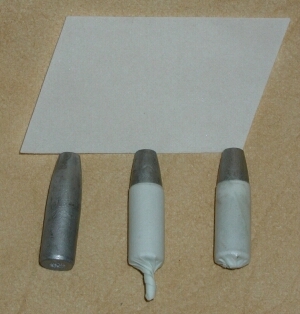 So far using 54 grains of RL-15 I chronographed these paper patched bullets at over 2600 fps! I pulled the rest of those - although there was no signs of overly high pressure that I could find - just didn't seem reasonable. I don't know if paper-patched bullets just slip through the bore easily or what. But does it seem to you like I'm getting good velocities given the powder charges used? Another thing that blew me away is these bullets will drill a hole through 1/4 steel at 100 yards going only 2250 fps at the muzzle! I never expected this from bullets cast from wheel weight alloy and air cooled. I did nothing to harden them, in fact I want them as soft as possible. These same bullets make an enormous wound channel through wet newpaper - they expand nicely. Perhaps they could hold together better, but since the wound channel was bigger and deeper than 200 grain copper-clad bullets I'm not worried. What do you think? Should I send ya a few to try? Maybe you could work up to that 54 grains of Rl-15 and see if you get 2600 fps and still within safe pressures. The Steve's Pages link you have suggests 51 to 55 grains of RL-15 for a 275 grain bullet in .35 Whelen, and that's jacketed. From all the reading I've done, and experience seems to bear this out, paper patched bullets generate less pressure than copper-clads. There's not a whole lot of folks shooting paper patched bullets so its difficult to compare notes with someone else. In fact I may be the only one in the world shooting paper patched bullets from a .35 Whelen right now. About the only pressure sign that I run into very often in my reloading is flattened primers. My understanding on these is that you can tolerate a flattened primer, but that's probably where you want to stop. Or do you have to back down when you get a flattened primer? The reason I tend to tolerate them is because I see them often with factory loads. I'd like to know what kind of paper Mr. Seyfried uses. I found a pad of 25% cotton vellum in the art section of my local office supply store, Staples. I noticed it was very difficult to find thin paper that had at least 25% cotton content. Fortunately I've been using the same pad for a couple years now. Due to the time invested rolling my own, I don't shoot a whole lot of PPs. However, with this new Whelen and mold I'm shooting them quite a lot. 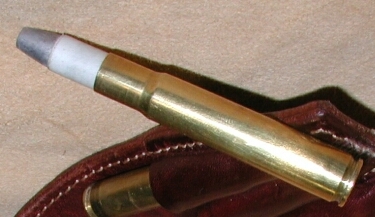 The bullet is shaped like a spitzer with a flat nose. It has a bevel-base not as extreme as a boat tail. The base is flat, not hollow. The flat base and flat nose are not of my choosing, but were limitations of the manufacturer, he can't do RN. Barrel length is 24". It's an Adams & Benet aftermarket barrel, I picked up from MidwayUSA for $90 (U.S.). Factory Magnum contour so it's nice and stout. I'm not a fan of ultralight guns. I'll get ya some pics sooner or later. Yes "rolling your own" is quite satisfying. Now if I could make my own primers and powder... Heh, some other fellows and I were posting on a forum about this topic and we got to joking about materials used. One guy suggested using cigarette paper since it's designed to be rolled. Another suggested moistening the paper with whiskey before rolling it on (instead of water or spit which is most commonly used). Finally someone pointed out that if we started rolling bullets in cigarette paper moistened with whiskey our Bureau of Alcohol, Tobacco, and Firearms would have a coronary! I finally got some photos of paper patched bullets. In the one photo, the white parallelogram is the 25% cotton vellum patched (just a pad of vellum purchased from an office supply store). The lefthand bullet is as it drops from the mold. 100% wheel weights, air cooled. No grooves, plain base w/bevel. The middle bullet is patched but before sizing and trimming. 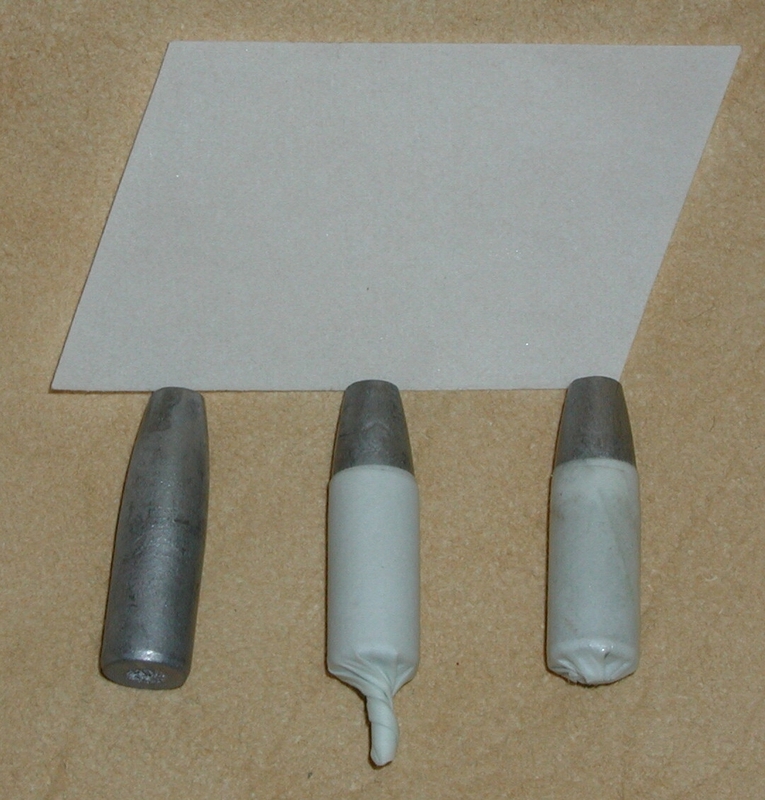 The righthand bullet is sized, trimmed and ready to load. The final picture is as loaded. 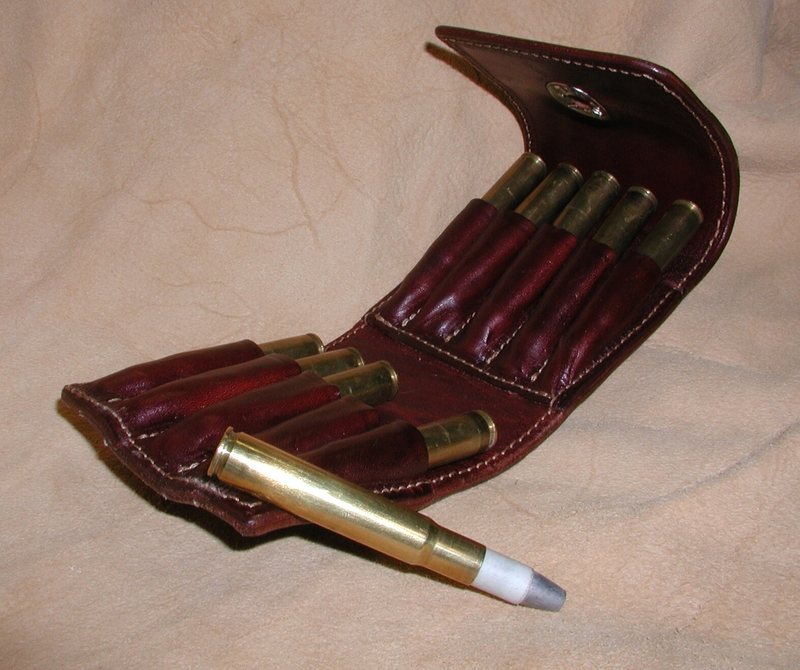 Although patches are much more durable than you would first expect, I don't think it's a bad idea to carry the ammo in a wallet. Sure go ahead [and publish my experiments on the web]. Everything I've been doing has been invented by someone else so I've nothing to patent. I would think that if it encourages someone to give it a try and they learn something I don't I would stand to benefit. And who knows, if there's enough of us, maybe some inventive company like Lee will come out with a paper-patching machine that would roll the patches on real quick. Right now the chore is nothing worse than lubing, and trimming cases - just tedious and boring, but if you watch the game while rolling patches it's not bad. I don't know that 100% cotton paper is necessary, I think 25% is the minimum cotton content. You need some cotton to make it shrink-wrap to the bullet. Thanks for the link. I'll have to try 100% cotton and see if it works better. Whelen, 24 and 32 lb paper may be on the thick side. I've no experience with it, I'm just going by what I read. Below is a link to the tracing vellum I use. It comes in either 100% rag or 25% rag. I'm using the 25% rag stuff. It measures 0.003 inch thick. I use 2 wraps around the bullet, so that would equate to a 0.012 inch (0.003" x 4 layers) increase in diameter. However since the cotton shrinks a bit, I actually get a 0.010 inch increase. My as-cast bullet diameter is 0.350 inch. Patched, they are 0.360 inch, then sized to 0.358 inch. If I could do it again, I might order the mold to throw a 0.348" bullet and hopefully skip the sizing process, but I didn't know I would have difficulties chambering a 0.360 inch bullet.